Washington Gov. Jay Inslee today signed into law a measure to close loopholes and raise penalties related to cell-phone use while driving. The law is intended to reduce car crashes, fatalities and injuries, and improve traffic. 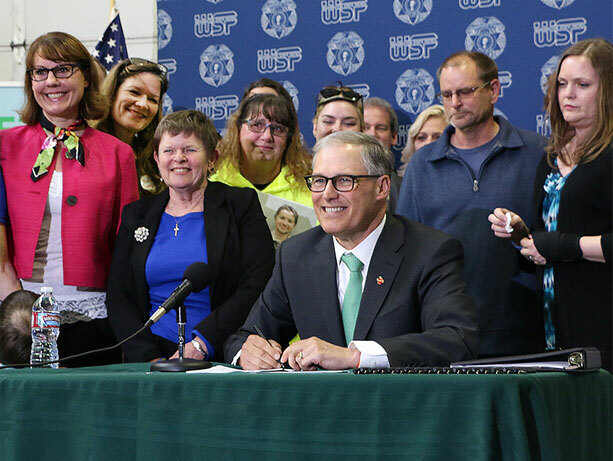 Inslee vetoed the bill's Jan. 1, 2019, start date -- which means it will take effect in 90 days. First-offense fine is $136 and will be reported to drivers' insurance companies. The new law permits drivers to use phones only with hands-free systems such as Bluetooth headsets and dashboard clips. Cell phone use is prohibited even when a vehicle is stopped at an intersection, where crossing traffic, pedestrians and cyclists are at risk. Repeat offenders will face escalating fines, and distracted-driving infractions are reportable to insurance companies. Lawmakers’ aim was to change drivers’ behavior and save lives, said Dr. Beth Ebel, a transportation-safety expert at the Harborview Injury Research and Prevention Center and professor of pediatrics at the University of Washington School of Medicine. She testified to state legislators about her academic research and clinical experience treating injured children at Harborview Medical Center, the regional trauma center. Ebel’s research includes a 2014 study in which 9.5 percent of observed drivers in Washington state were distracted by a cell phone. Among those drivers, the study reported, two-thirds were texting. Texting increases a driver’s crash risk by a factor of 23, or the equivalent of drunken driving with a blood-alcohol level more than twice the legal limit. Pedestrians and bicyclists are at particular risk, Ebel said; they constitute about half of all roadway fatalities in Seattle. Washington has banned texting and driving since 2007, the year that the first iPhone was released. Critics and police officers said that law has become increasingly difficult to enforce because drivers use their phones for many tasks not specified as infractions even though they are equally risky. The new law simplifies the rule: Any driver interacting with a phone is in violation, excepting single-touch activation and deactivation, and emergency calls. Ebel said she hopes the new law will encourage drivers to plan ahead – such as by integrating hands-free technologies or setting up GPS routes before trips begin – in order to avoid a ticket. By taking precautions to avoid illegal distractions, drivers will make the roads safer for everyone.